This is how Gov. Cuomo celebrated making it legal to kill babies the day before they are born. And, despite that “archaic” law, New York City was able to kill more black babies in the womb than bring them to birth. And it is utterly Orwellian to refer to it as the “Reproductive Health Act.” Why not call it for what it is? And what, exactly, does that mean? What if the mother’s mental health needed to be protected? What if she felt, the day before her due date, that she just couldn’t take the stress of having a child. Would that merit abortion? But that is to beg the question, since the baby could easily be delivered and adopted. We’re talking about a totally viable baby! A baby who, under normal circumstances, would soon be crying and nursing outside the womb. Considering that more Black babies in New York were aborted than born, the Progressives continue to show their True Racist Mindset. The Progressives are quite happy to claim their supposed support for the Black Community while exploiting them for money and votes. But in Reality, the Racist Progressives want to keep the Black population down making it easier to subjugate them. This Mindset also applies to other Minority Communities that Progressives wish to exploit and control. Those advocating especially for this extreme abortion law should be grateful their mothers didn’t have this blood lust when they were pregnant. In comparison to Hitler’s systematic methods of slaughter and Pol Pot’s murderous ravaging in the killing fields, today’s slaughtering butchers (posing as politicians and medical professionals) make the Jeffrey Dahmers of our society seem more like a choir boys. Their impeachment/revoking of licenses and imprisonment should be immediate with criminal charges being first degree murder. As these innocent are cruelly and systematically exterminated… tossed upon a horribly bloodied altar to the god of “SELF FIRST!”…I pray the perpetrators of these horrible crimes, …those who have sanctioned this slaughter house activity, the ‘professional butchers’ whose lust for gain have lost their way having trashed their conscience and physicians oath long ago, the ‘mothers’ whose social lives “can’t be bothered” with such entanglements, the deadbeat and soulless dads who are little else than pleasure seeking jackals: may the unbelievable horror they have unleashed on the most innocent and defenseless among us be at the forefront of their ever-waking moment, a vivid reminder of the horrifying cruelty of their actions….and a unending terrifying visitation of their self-inflicted nightmares. The writhing screams of the tortured defenseless can be heard…..and of certainty by the One who has given them Life. There will be hell to pay…. And yet NOT ONE LIBERAL sees all this baby killing as being in anyway, racist, even though it FLAT OUT TARGETS BLACKS more so than any other group.. This is genocide. This is a holocaust brought on by the liberal Nazis in our state and federal governments. Why are blacks not up in arms over this. Is it because it is a conveniate form of birth control to cover mistakes? For all I know NY State has established a gulag network in the Adirondacks and are systematically killing anyone suspected of being disloyal to the state. Most Democrats would support such a policy, until they get their summons to visit the park. Actually, since the new law has no conscience exemptions, there will be a kind of gulag for medical staff who refuse to take part in the abominations. They’ll be fired, de-licensed, fined, blacklisted, bankrupted, and/or maybe even imprisoned — like what’s already being done to the people who won’t take part in homosexual and “trans” ceremonies, or even nuns who refuse to pay for abortifacients in their insurance plans. Exactly. Don’t want to participate in their purging, then YOU GET Punished for it.. To me that is totaly borked up. demonic uses it’s minions to do to the least of these and so unto Him. off of his offensive face and all those involved with the murders. If I were terminate a litter of unwanted day old kittens in the same manner as a third – trimester baby, most women would view me as a monster and I would probably end up in legal trouble for animal cruelty. Maybe we should make a push to classify fetuses as animals so PETA could start being useful. Around 9 or so years back, i remember reading a story, about a guy who got 50k or so in fines, for Killing not just 3 dozen kittens by starving the mothers, but also a # of other animals.. So i agree. ITS blarked up someone gets punished MORE for killing animals than they do their OWN offspring. BUT as i remarked a # of days back. SEVERAL Of our public officials have stated “we need immigrants as OUR birth rates have been dropping for 5+ years. WELL DUH! If you are going to keep allowing unfettered BABY KILLING, of course your birthrates will drop!!!! New York has become an evil place. Living or even visiting there is an immoral act by my definition. I am hard put to define an act of greater evil than infanticide. That’s exactly what this is, wanton murder of babies because they are inconvenient. I vote that we kick NY and California out of the country and let them sink in their own sewage. They can serve as an example to other ‘enlightened’ or ‘woke’ states. No matter HOW much depravity we show these places as being, the left simply will NEVER wise the hell up and recognize it. BECAUSE TO THEM Depravity is ok.
Let’s make that retroactive for all libtards! You know there is something to hide when this “law” had to be passed in the middle of the night, just like the un-Safe Act was. How anyone can justify the killing of babies up until the time of birth is beyond me. 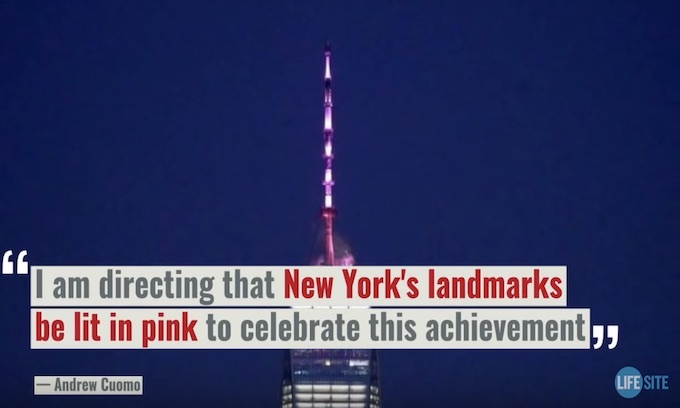 And then to add insult to injury Cuomo lights up our public buildings in pink???? I am sure all the unborn female babies really appreciated that hypocritical maneuver. Certainly their “womens’ rights” weren’t protected. And lets not forget that the founder of Planned Parenthood, Margaret Sanger, was one of the biggest racists to walk the earth. She wanted to eradicate the blacks by aborting their babies. Next in line after blacks were the poor immigrants (Italians in the 1920’s) who weren’t white enough for her either. Cuomo should be excommunicated from the Catholic Church for his celebration of this madness. There’s MANY of these demon-rats that need to be IMO MORE than just excommunicated..
Now I get it. Cuomo thinks USA has never been great because we haven’t been slaughtering enough babies. We now join China, North Korea & surprisingly enough Canada in the govt approved & authorized policy of allowing even live birth babies to be butchered, ripped apart & thrown in trash or down the toilet or sold for parts like junk cars. New York is so proud & will likely erect a statue at state capitol to honor Gosnell for his pioneering methods of crushing the heads / dismemberment of full term healthy babies who somehow survived an abortion attempt. But no worries for Dems since American citizens & their babies are easily replaced with ignorant unvetted unqualified foreign nationals who could care less how corrupt or tyrannical a govt is long as it throws some free stuff their way. What i find sickening is that you don’t even need to be a doctor now, to perform these abortions as per the laws in NY.. AND the doctors/abortionists (or as i call them murderers), they don’t even have a duty now, to rescuttate them if the baby survives the abortion and gets pulled out of the mother.. SO in effect its a post birth abortion. I keep seeing the very sad ads on TV from ASPCA detailing the plight of abandoned puppies and kittens. I sympathize. Yet the brutal slaughter of human babies is being celebrated by the immoral leftists. IMO to them, nothing’s enough.